Create a quick, delicious espresso without having to master the tricks of the barista trade with the Hamilton Beach Espresso Maker. With the fool-proof ease of capsules, you can make your own cup in just a few quick steps. Insert your favorite capsule flavor, whether it’s from Nespresso or other compatible brands, set down the bar, select the cup size and brew. 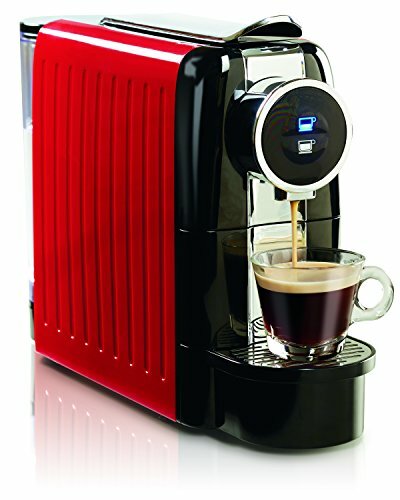 Fast heat up and a 19 bar Italian pump create a quick cup with rich crema and taste. Customize your cup size by choosing from espresso or lungo. The water tank holds up to 22 oz. so you can make multiple drinks without refilling. The used capsule storage holds up to 13 at a time. Automatic shutoff after 4 minutes gives you peace of mind.